Michelin-starred chef and restaurateur, Raymond Blanc, hosts a dinner on board The British Pullman, sister train to the Venice Simplon-Orient-Express, on 16th November 2013. This event launches a series of ‘pop-up’ dinners on board iconic trains throughout 2013 and 2014 hosted by some of the UK’s most celebrated chefs. 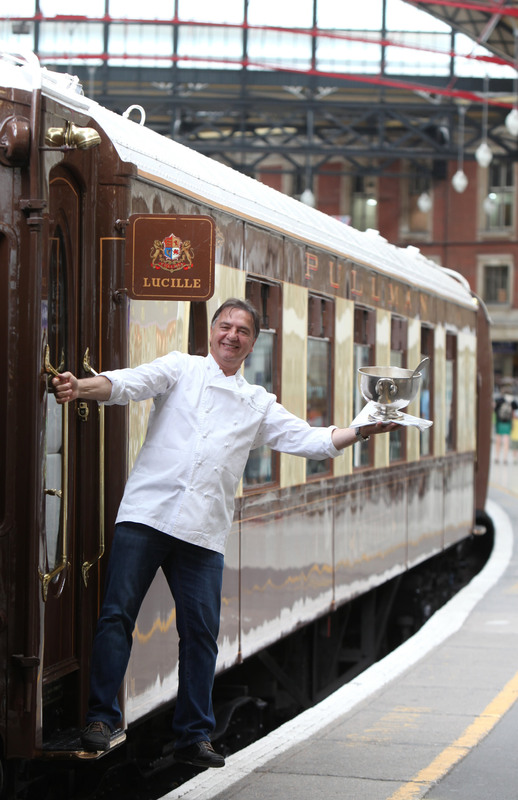 Raymond Blanc’s specially created 7 course menu, accompanied by the sommelier’s choice of fine wines, will be served to just one hundred guests who will enjoy this fine dining experience whilst traveling in the stylish and elegant carriages of The British Pullman through the English countryside. This event reunites Raymond Blanc with his one time apprentice, Robbie Gleeson, Executive Head Chef for the UK Day Trains. The British Pullman is a train known for its very British traditions and heritage - it offers such a fantastic experience and of course I am delighted to be cooking on board alongside Robbie and meeting guests who will be joining us on our journey - I hope to make their trip on board as special as I can. Champagne and canapés are served as guests board the train with their affable host. Throughout the evening, Raymond will be spending time with guests, sharing his passion, curiosity and expertise for cooking as demonstrated in his current TV series ‘How to Cook’ on BBC2. Dining on board the British Pullman is one of the UK's most exclusive and luxurious dining experiences. The British Pullman emulates the finest of British traditions and heritage. With its original 1920s art deco carriages and exceptional personal service by authentic stewards in fine livery the train evokes the golden age of travel; allowing guests the opportunity to engage with a period of time when travelers were elegantly dressed and had the time to slow down and enjoy the journey. The Dinner with Raymond Blanc costs £495 per person. Raymond will host a dinner on sister train, The Northern Belle, departing from Manchester on 2 November 2013. Further ‘Dinner Dates with’ will be announced shortly. Raymond is also Chef Patron of Orient Express property, Le Manoir aux Quat’Saisons.